A well-known annual celebration of daffodils in Cornwall which was delayed for a month because of a lack of blooms will get under way on Saturday. The National Trust put back its Daffodil Week at Cotehele for the first time ever because of the absence of flowering daffodils. The event attracts thousands of visitors from all over the UK keen to see more than 200 varieties. Trust staff estimated that spring was about four weeks late this year. The Cotehele estate, near Saltash, is famed for its array of daffodils and used to grow the blooms commercially. This is the first time the event has been delayed. Cornwall, usually regarded as the UK's mildest county, was affected by the unusually cold weather of heavy snow and hard frosts at the start of the year. 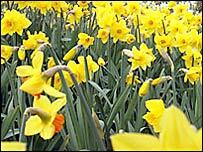 The delayed daffodil event, which was originally planned from 11 to 16 March, will now run from 8-13 April.